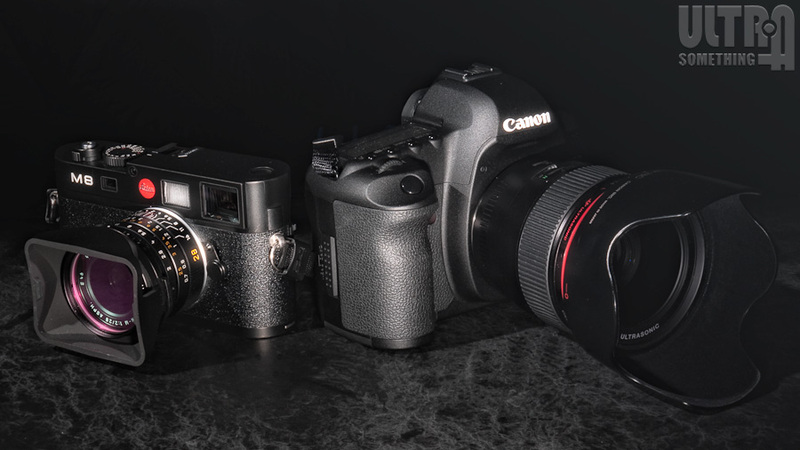 I purchased my first Canon EOS SLR nearly twenty years ago and, though I have sometimes gazed longingly upon the more specialized offerings from Leica, Hasselblad and Linhof, I’ve remained faithful to the format ever since. As an instrument of general photography, the SLR is simply more flexible, more adaptable, and more affordable than the alternatives — an attribute that’s served me well during my metamorphosis from casual hobbyist to serious professional. But in every relationship, there exist little irritants — little traits that, over time, grow from quirky annoyances into colossal inadequacies. And my long partnership with the SLR is no exception. For example, the SLR’s most endearing characteristic — its flexibility — has gradually become one of its most nettlesome. To sate the multifaceted needs of an ever-expanding marketplace, SLR designers continue to create hundreds of specialized settings and dump them into fussy, multi-level, on-screen menus that impact the camera’s immediacy and usability. While all these little settings have their time and place, they’re frequently configured to satisfy the requirements of the previous shot’s time and place, and not the one I wish to take currently. Problematic, too, is the format’s escalating bulk. Digital technology has yielded heftier SLR bodies and more cumbersome lenses, with each generation of sensor technology demanding greater performance from the glass in front. I reached a point where, unless I was going on a photo assignment, I was increasingly unwilling to take the SLR with me. Its heaviness nagged at my shoulder, and its prodigious lenses were pushy and ostentatious in crowds. For many photographers, the path ends here. They simply carry an SLR when image quality matters, and they carry a point-and-shoot when portability is key. I would likely have reached the same conclusion had my photography compulsion not extended to street photography — a discipline with a rather unique set of camera requirements. But fantasies are for fools, so I went with Plan B — a Panasonic DMC-G1 micro four-thirds format camera. With its slimmer profile and its ability to mount rangefinder lenses, the micro four-thirds format provides an intriguing solution to several street-shooter issues. In my final two Like a Leica entries, I discussed my preliminary thoughts about the format and judged that the G1 was, indeed, a better “street camera” than either the SLR or the point-and-shoot. Ultimately, I concluded it was an ideal compliment to a rangefinder, but not a substitute. In the months since I first published those articles, I have shot extensively with the G1 — using both its kit lens and an adapted Voigtländer 35mm f/1.4 Nokton lens — and my conclusions are essentially unchanged. I have come to love zone-focusing with the Voigtländer, and have used that capability to capture images that would never be possible had I lifted the camera to my eye. And, speaking of my eye, I’ve become somewhat less-enamored of the G1’s electronic viewfinder. While it’s definitely better than having no viewfinder at all, beaming a brightly lit and flickering image directly into my eye has, on several occasions, triggered an optical migraine. If you’re prone to these stroboscopic fits of psychedelic temporary blindness, you have yet another reason to prefer optical viewfinders to the electronic variety. I’ve grown to love the G1’s articulated LCD while growing to loathe its quasi-consumer leanings that, more often than not, force me to fight the camera rather than work in tandem with it. Also, with a sensor only 1/4 the size of a full-frame SLR, the G1’s image quality is (to my eyes) more akin to a high-quality point-and-shoot than an SLR. So, like all things in life, the DMC-G1 is a compromise. But, more than any camera I had used previously, I could coerce it to become a reasonably competent ‘street shooter.’ With its articulating LCD and natural M-mount teleconverter ‘feature,’ the G1 earned a permanent compartment in my street-shooting bag — as my secondary camera. But that bag’s primary slot remained open and waiting for what, inevitably, could be its only rightful occupant — a rangefinder. Unfortunately, a new Leica M8.2 body costs three times more that I was willing to pay. The previous model, the M8, was also priced well beyond my reach. Even with used M8’s, there was a substantial gap between the going price and my actual budget. But I knew, if I spent even a single penny of that “seed” fund, the gap between wanting an M8 and owning an M8 would only widen. So I sat on the cash and resigned myself to waiting a couple of years for the gap to narrow. I kept a daily watch on eBay, but never found a ‘deal.’ I called the Leica guys at popflash.com and told them, if they ever come across a cruddy but functioning M8, to give me a call. After a couple months of waiting for my desired camera to cross their threshold, Popflash got proactive. They called Leica with my request and, apparently, Leica had a pair of used and abused factory demo M8’s in their headquarters. Supposedly, the bodies had seen enough handling and wear to make them undesirable for Leica collectors. But I’m not a collector. I’m a photographer. And I have no interest in purchasing a camera just to display it in a glass case. I could never see the point of owning a camera that devalued as soon as you mounted a lens on it. So, although my interest was piqued by the prospects of a ‘beater’ Leica, I knew I couldn’t possibly realize my fantasy of getting an M8 for the price of an R-D1. And, sure enough, I was right. My fantasy wasn’t realized — it was exceeded! This M8 — which comes directly from Leica with a 1-year factory warranty, a brand new battery, and includes two free IR-filters of my choice — was priced considerably less than I’d ever seen or dreamed. Needless to say, I leapt at the opportunity to own a factory-warranted camera that had already achieved its full devaluation. I can treat it like a camera, not as an objet d’art. I’ll be able to bump it on a lamp post or scoot it across a table without incurring a single financial penalty! If there are any functional problems, I can have it factory repaired for free. And, most importantly, a dirt-cheap M8 means I can put the savings into the most important component of any camera — the lenses. Therefore, I’m complimenting my Voigtländer 35mm f/1.4 Nokton with a used 28mm Summicron. So the stage is set. I, a 20-year veteran of the SLR (with all its inherent trappings, baubles and luxuries), am about to enter the bare-bones world of old-school rangefinder shooting. In part 2, I’ll begin to report on the inevitable thrills I’m sure to encounter and the frustrations I’ll likely endure.